Economic indicators measure the strength of a country's economy. They can provide information on one of its sectors - such as housing - or give broad measurements of GDP and unemployment, among other things. Forex traders analyse these indicators because they have an impact on currency prices. This article focuses on 2 important economic indicators that determine the value of a currency: the interest rate and inflation. Interest rates are very important in the forex markets. A country's interest rate is set by the central bank. It is a tool that is used to manage the economy - either by increasing the interest rate to curb inflation or lowering the interest rate to promote growth. Each country's central bank lends money to some banks. The basic interest rate determines the amount of money that these banks must pay to borrow money. Banks also lend money to other banks and consumers in the form of loans in exchange for an interest payment. If the central bank increases the interest rate, borrowers have to pay more for the money they borrow. This reduces their purchasing power on other products and therefore influences the economy. For example, if the interest rate increases, the monthly payments of those who have a mortgage will increase. An interest rate increase is a tool used to combat excessive inflation because if households have to pay more each month to pay off their mortgage, they will have less money to spend on other goods and services. When consumer demand decreases, the prices of goods and services also decrease. In addition, if a country's economic growth is too low, the central bank can lower interest rates to reduce these mortgage payments. People will then have more disposable income to spend each month, which stimulates the economy. Companies that borrow money to expand their business and hire new employees are also affected by interest rates. If they have to pay back a higher amount because of increasing interest rates, they have less money to invest and hire new employees. First of all, a higher interest rate is the sign of a strong economy and investors are more likely to invest in an economy that is growing. The demand for the local currency is likely to increase, and this usually leads to an increase in its value. A higher interest rate also means that you get a better rate of return on capital that you hold in your bank account. Investors therefore prefer to invest their capital in countries that have higher interest rates. Inflation measures how fast the prices of goods and services increase over a given period of time. An increase in inflation means that prices are quickly rising. If the inflation rate decreases, the prices of goods and services are still increasing, but at a slower pace. If the inflation rate rises, household purchasing power is reduced and this can have a negative effect on the country's economy and currency. However, if a country is experiencing deflation, which means that prices are actually falling, investors may also consider that the economy is in poor shape. Therefore, it can also have a negative effect on the value of the currency. Most of the time, a central bank will try to target an acceptable level of inflation, for example the ECB (European Central Bank) will aim for a lower inflation target, but one that remains close to 2%. If the inflation rate moves within the range defined by the central bank, the value of the currency won't move much. The value of the currency will react much more if the inflation rate is significantly outside of this range. In order to protect consumers from excessive inflation, central banks tend to raise interest rates. As explained above, this reduces consumers' purchasing power, reduces demand and reduces the prices of goods and services. When inflation is higher than expected, forex traders can buy a country's currency if they think that the central bank is going to increase the interest rate, as an interest rate increase is one of the factors that drives the value of a currency. However, this depends, because excessive inflation can erode the value of capital within an economy and the value of the currency can therefore decrease. Due to all of these reasons, the inflation rate is an economic indicator that is difficult to use to determine the probable increase or decrease of a currency's value. Economic indicators point to the strength or weakness of an economy. Traders use these reports to determine the probable value of a currency. A central bank's interest rate is a very important factor in the value of a currency. 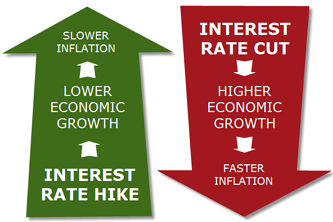 The interest rate can be increased to curb inflation and lowered to stimulate the economy. A higher interest rate usually results in a stronger currency and a lower interest rate usually results in a depreciation of the currency's value. Inflation measures how quickly the prices of goods and services increase over a given period of time. Central banks try to achieve acceptable levels of inflation. If the inflation rate is outside the target rate, this can have an adverse effect on the value of a currency.